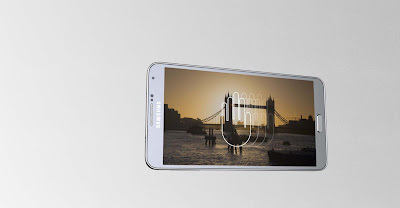 Samsung galaxy note 3 is an android phablet Smartphone produce by Samsung electronics. After the success of galaxy note II, the note 3 was designed to have a lighter, more upscale design than previous iterations of the galaxy note series, expand upon the stylus and multitasking- oriented functionality in its software which includes a new navigation wheel for pen- enabled apps. The galaxy note 3 designs were intended to carry a more upscale, premium look in comparison to previous Samsung devices. It has a thickness of 8.3mm and is slightly thinner than the galaxy note II and slightly lighter. Galaxy note 3 uses a 2.3 GHz quad-core snapdragon 800chip. The galaxy note 3 ships with an S pen stylus, which has been updated to use a more symmetrical shape. It is the first Smartphone to support for USB 3.0 which enables faster data transfers and charging when connected to compatible port. The galaxy note 3 comes with android 4.3 jellybean and Samsung’s proprietary touch wiz nature 2.5 user interfaces and software. Additional pen-oriented features have been added to the note 3 software. The multi window functionality has been updated with expanded app support, the ability to run multiple instance of a single app. It has the ability to drag and drop content between apps. An update to Android 4.4 “kitkat” was first made available through Samsung kites. The update adds user interface tweaks such as a camera shortcut on the corner of the lock screen, options for setting default launcher and text messaging applications. It supports printing and a new location setting menu for tracking and controlling the use of location tracking by apps. It also had made significant changes to the handling of secondary storage on the devices for security reasons.